Men's suits - Can't figure out what type of fabrics you should look for in a suit? Let's review what you are likely to come across when hitting the shops. Tweed is a very heavy wool fabric, popular in places like the British Isles where there seems to be a permanent chill in the air. The average wearer of tweed is more mature if you get my meaning. Stay away from tweed, especially if you're packing a few extra pounds. Tweed is not the larger man's friend. For a suit, it might be a bit too hot in most office environments. While nice, it's not an ideal fabric for a suit. This is usually a kind of wool crepe, which is a lightweight fabric. It's more of a summer weight, the sort you might wear in warmer climates. Being lighter, it is also more susceptible to wrinkles, and therefore requiring frequent visits to the dry-cleaner. This clearly would not be an every day kind of suit fabric. 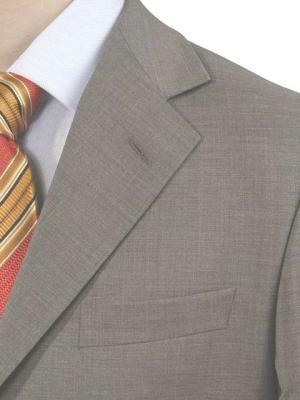 As I have stated before, worsted wools are your best bet for a suit. These will be your gabardines or mid-weight corded wools. They are durable, wear well and usually fine for year-round wear. They can be a little lighter or heavier, depending on the weave, but consider them mid-weight. 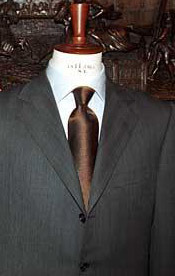 You might come across a suit that is advertised as a "high-twist," 100, or Super 110. This just means that the suit is made of a worsted wool yarn that has been twisted more often than the usual 60-80 twist fabrics. This makes it a finer cloth of a somewhat lighter weight. Such suits would be perfectly fine, therefore, for spring, summer, and fall, but might not work in winter. Cotton is probably the most acceptable choice for men's suits that isn’t wool. If you live in a warm place this is a great alternative look to wool. I prefer cotton suits that have a little lycra or something that gives it stretch. 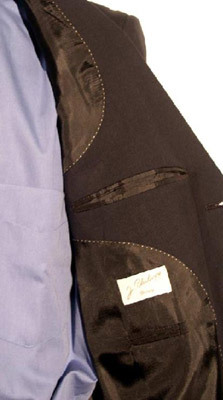 This will allow your suit to keep it’s shape and will prevent the color from fading more quickly. Okay, you look at linen and you think of a beach on the Mediterranean or the Caribbean Islands and you’re strolling down that beach with your pants rolled up a touch and . . . ahhh. Stop dreaming! As a fabric goes, linen wrinkles quickly, stains, and doesn’t wear well. It is not acceptable for a suit, unless you really are one of the lucky few that actually do live on a beach in a tropical place. The 70's are over so let’s move on. A very light polyester. Again, let’s move on.